After being a little disheartened with my failing Skiving Snackbox, I thought I’d try making something simple and fail-proof . Friendship bracelets! Needless to say, my first attempt was worthy of a Troll. 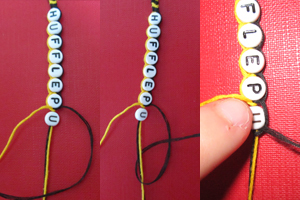 The only thing I learned from that bracelet was to not multitask while making it. It really requires your attention, particularly if you’re just starting out. My second attempt was much better. 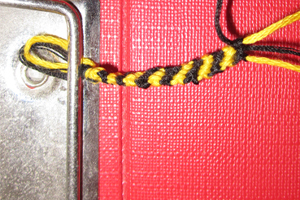 Following the guide here (Alternative Tutorial 1), I began to make a popular candy-stripe bracelet with 2 strings folded in half to make 4. You can either start by making a loop, or if you use 4 strings, tie a knot and braid a length of it (you will need to do the same at the other end). I also found their guide of 48″ in length pretty close (once you fold in half for the loop it’ll be half this length, however, if you’re using 4 strings and doing the braid method, they can be cut shorter). When I started adding beads the strings got shorter and in the end they were *just* too short to tie, so you may want to cut a bit extra to be on the safe side, and it of course depends on the size of your wrist. Once you’ve made your knot, you can start tying more, following the guide linked above. The more strings you add, the thicker your bracelet will be, but I thought the thin bracelets looked quite cute and dandy. 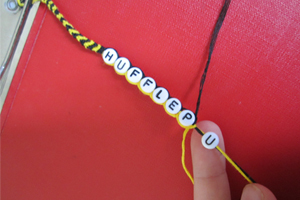 If you do not want to add beads, just keep following this pattern until you get your bracelet as long as you need. To be honest, I didn’t like the beads and will probably be making mostly non-beaded ones from now on, but they do make a nice touch. When adding the beads, I followed the simple video tutorial here, however here’s a quick run down. You’ll be making backward and forward knots. Depending on how many strings you have, divide them into 3 (I used 2 in the middle). String all your beads onto the middle string (I needed a needle to thread them through). Then grabbing your thread on the right, you’ll want to pull it left over your middle strings, and loop it back underneath and up. 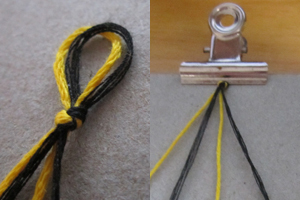 Pull it right up tight to the bead, and do the opposite with the string on the left. String on the next bead and repeat. The video really shows it much better. Although I knew it was inevitable, the beads will shift and move, and you’ll find the thread shifting across the thin edge of the bead and sometimes up over the letter. You can attempt different methods, but overall it wasn’t too bad. Now that I think about it, you could probably have just put knots in between them. If you’re very concerned, you may want to try gluing the threads to the sides of the beads. 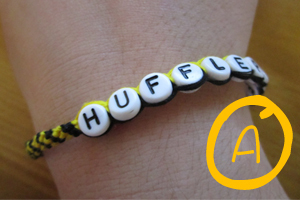 Continue your pattern with the rest of the bracelet. To end you can use a method of braiding 2 plaits (which will tie through your loop) or making an adjustable one. It’s really up to you, but you should know which method you want to use before you start as it will depend if you braid or loop in the beginning. As stated before, mine did end up too short to tie around my wrist, but I think it will make an excellent keychain! 🙂 That’s Acceptable. 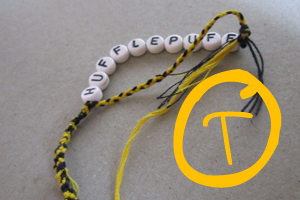 Unfortunately, I only bought one pack of letter beads, and I do have enough to make Ravenclaw and Slytherin bracelets, but not enough letters for Gryffindor! However, like I said, I think I much prefer them without the beads as they just seemed fiddly, so we’ll see. 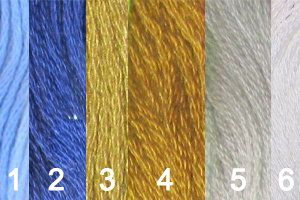 The only other question remains is what alternating colours to make Ravenclaw. Throughout the movies they are seen as blue and silver, but in the books they’re described as blue and bronze. 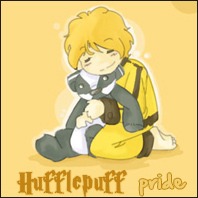 I think 1 and 3 would look okay, but it also depends on what golden colour I make Gryffindor, and whether Slytherin will be silver or white! I’m a bit worried about the silver turning out more gray looking. All in all, they could make great party favours! ‘Til next time! 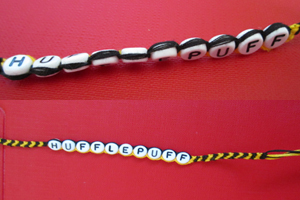 This was inspired by these Harry Potter themed bracelets on DeviantART. ~ by acciomagic on September 2, 2011.